A Dental Implant is an artificial tooth root that is placed into the upper or lower jaw to replace a missing tooth or teeth. It is often done via Computer Guided Surgery and is 100% biocompatible (the same material as hip and knee replacements). A periodontist places the implants, and the patient’s dentist restores the implant (attaches the teeth). Dental Implants can be an option for those who have lost a tooth or multiple teeth for various reasons such as; periodontal disease or an injury. You will never go without teeth, because we always arrange ahead of time for you to have a temporary replacement. There are three parts to a dental implant. 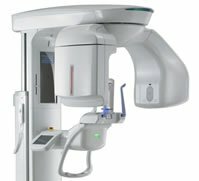 The implant itself is a titanium screw or anchor that fuses to the patients bone after a period of healing (typically 2 to 4 months). 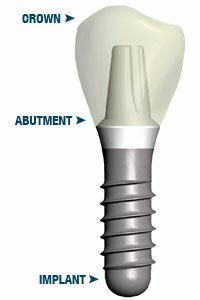 An abutment which attaches the tooth or teeth to the implant. Usually, the periodontist places a temporary abutment, and the restoring dentist places the final abutment. And finally, the replacement tooth or teeth which are either screwed or cemented to the abutments. Sometimes tooth removal, implant placement, and coordinated restoration by the dentist can all be done the same day. Sometimes it can take a few months for the implants to integrate (fuse to the bone) before the tooth or teeth can be attached to the implants. Some dentists advertise themselves as "Implantologists" or "Specialist in Implants" - there is no such thing! Any dentists can legally place dental implants, so it is important for a patient to consider the training and background of the individual who is performing this often complex, serious surgical procedure. Periodontists have completed a certified residency program after dental school (a minimum of 3 years), which includes rigorous training in the surgical placement of dental implants.